One day, sat down with my dinner on a tray before the TV, it suddenly occurred to me that this is one of the many situations in life that could be vastly improved with a mosaic. 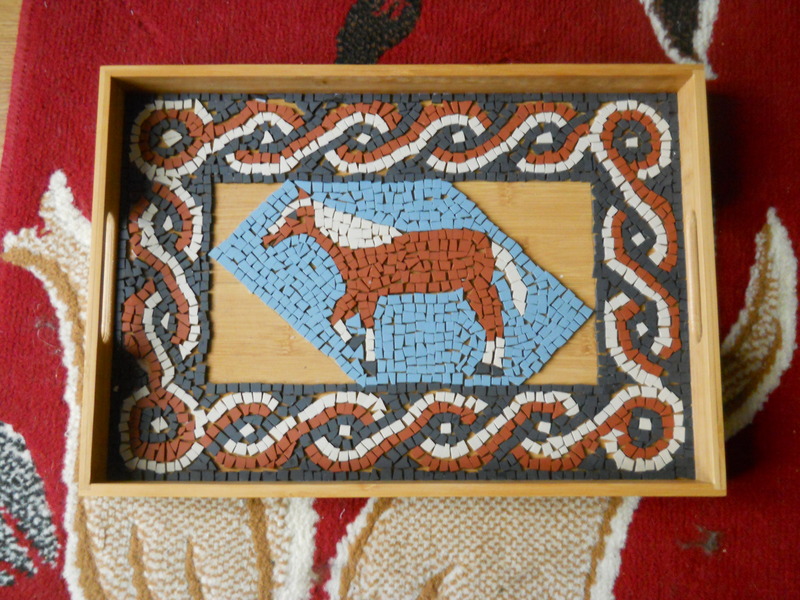 With this in loose rationale in mind and the idea of mosaics as gifts I decided to make one. Therefore I present to you, mosaic trays. 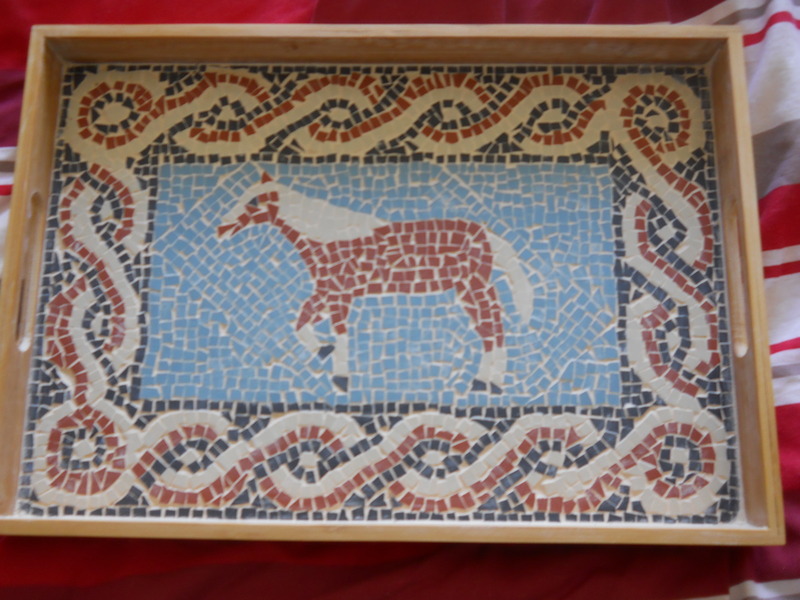 The person for whom this gift was intended is very much an equestrian fanatic therefore there is no surprise really that at the centre of the design is a horse. In order to get it just right I took quite some time practising first: I’m much more at home with drawing geometric patterns than sketching live studies. 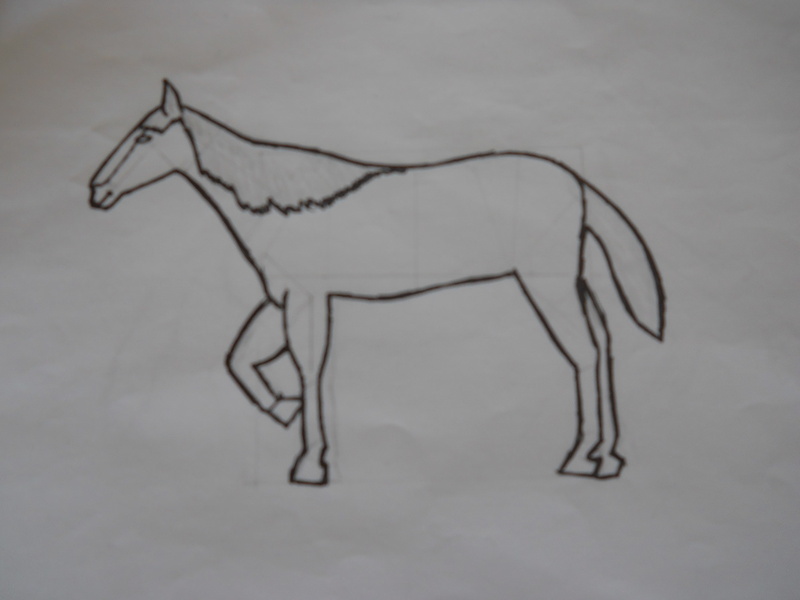 Once I had my best horse impression I simply placed the paper drawing over the tray (which I had sourced from a local shop – if I ever master carpentry id’ make my own base) and traced the outline numerous times in pen until the ink fed through to mark the face of the tray. 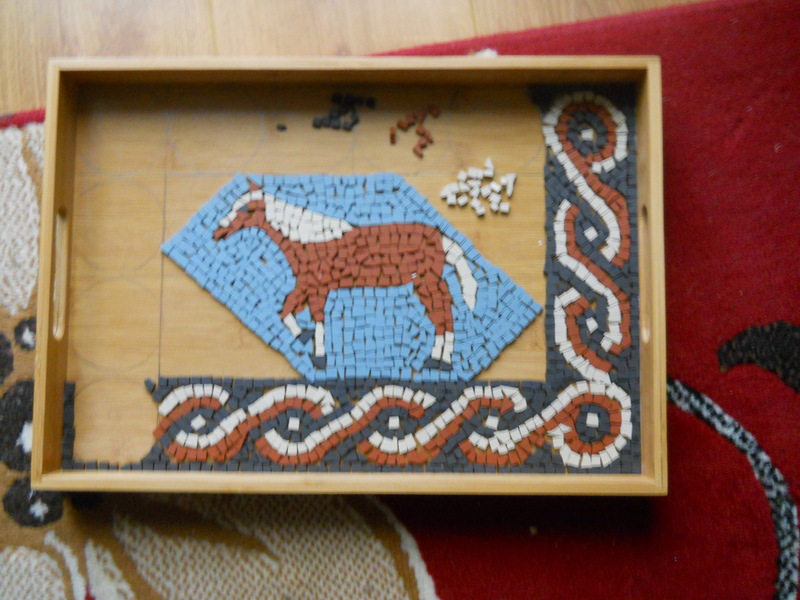 After that stage I somewhat reverted to type making the mosaic from the inside out. In the photos one may notice that I had left sections of the background blank before filling them in, however this was merely because I was a little uncertain on using blue as a background. I needed to do this as I had no other colour that would not have affected the central figure, therefore I was waiting to see how the rest of the scheme turned out before I filled these sections. Eventually I concluded that the blue would work as a wholesale background and thus filled in said sections. Yet again in this mosaic the last two photos really show just how much of a difference the grout makes to pulling the design together, and in this case brightening it up. Grout does come in all shades so it can be an important decision. However I’ve found that the grey grouts can make the designs look a tad heavy so instead I have favoured white, it certainly fits well in to a light domestic environment. All in all, I’m quite happy with how it came out, although the grouting was a little messy, but most importantly the person it was intended for loved it and that’s all that I can hope for. So a happy birthday to her.